Paterson, NJ (December 9, 2014) . . . Velcro Industries is the original and premier global manufacturer and innovator of hook and loop fasteners. What began as a novel invention in the 1940s has grown into a household name with over 400 active patents and over 200 trademark registrations in over 150 countries worldwide. Their products are used for applications across an extensive variety of industries including packaging, medical, apparel, agriculture, industrial cleaning, transportation, athletics, and military. For a new application, Velcro Industries was presented with a challenge and needed to identify a converter that could meet their needs. “The foremost challenge we faced with this project was identifying converting specialists with specialized coating experience,” says Joe Anderson, Senior Mechanical Engineer at Velcro Industries. “Our product is like no other due to its loose woven nature, narrow web widths and the requirement to coat multiple adhesive varieties in a single line.” To find a converting company that could meet their needs, they attended the ICE USA 2013 show. It was there that the project group first connected with New Era Converting. The end result was a narrow web coating/drying line, fed by a custom multi-spindle unwind system designed to automatically splice unwind rolls every 2-3 minutes. The trials led directly to the choice of coating method, which is modular in design to allow future flexibility given the customer’s wide range of substrates and coatings. The new system had been proven out through New Era’s extensive tests, and the equipment is currently on order with Velcro Industries’ approval for the design. Fabrication of the new equipment will commence in the coming weeks. Velcro Industries together comprise a technology-driven, global organization providing fastening solutions that solve problems in simple, elegant and surprising ways for businesses and consumers around the world. With more than 50 years of experience, Velcro Industries is proud of their heritage in innovation. 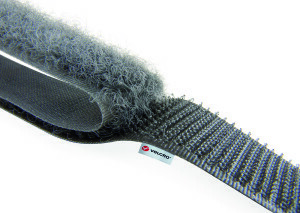 Velcro Industries B.V. owns over 400 active patents and numerous trademarks, including the VELCRO® mark which is registered throughout the world. Velcro Industries offer global resources for world-class solutions, with manufacturing locations in Spain, the United States, Canada, Mexico, and China and sales offices around the world. “Like” VELCRO® Brand on Facebook: http://www.facebook.com/velcrobrand for more information.